While today's conditions were lighter and weren't quite as up and down as yesterday, there was a significant right shift that forced the race committee boat to up anchor and move the course prior to race four. "Hardest for us were the starts," admitted Bruni. "They were okay, but not brilliant and especially the last one." In this they received a penalty at the start, but impressively fought back to finish second – Bruni said he was most proud of this race. As to why they are doing well here, Bruni thinks it is because of the training they managed to put in with Törnqvist prior to the event. 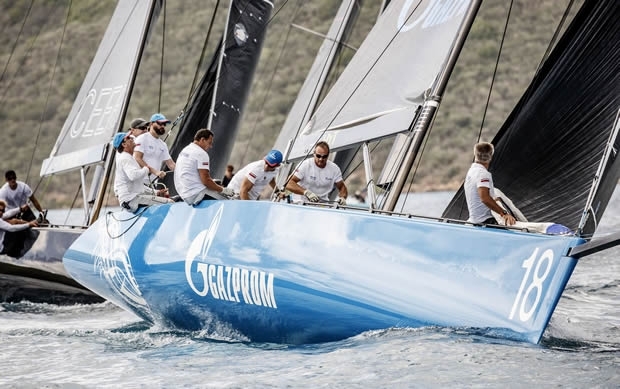 "There are at least five teams fighting for the podium and overall it still not clear who will be there and in which position," observed Prosikhin.